It's that time of year again, where traditions come out more than any other time of the year. Whether it's where to spend the holidays, when to open gifts, or what to serve for the big holiday meal, traditions are an important role of every family's Christmas. 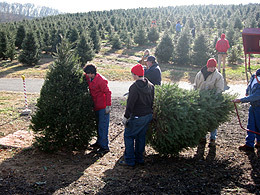 Continue your holiday tradition, or start a new one, with a real Christmas tree form Jarrettsville Nurseries Christmas Tree Farm - one of the largest Christmas tree plantations in the state of Maryland!! At Jarrettsville Nurseries, we know all about family traditions. As a 3rd generation family farm, we have been catering to those traditions since 1961. Some traditions are centered around when to pick out the perfect tree, while other traditions are rooted in the kind of tree to be selected for the Christmas celebration. 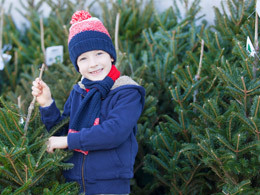 At Jarrettsville Nurseries we have many real Christmas trees to choose from. Whether you are looking for a fresh-cut Christmas tree, live Christmas tree, or would like to choose and cut your own Christmas tree, we've got the perfect one for you! And don't stop there! Before you head home, take time to enjoy some of the other holiday experiences that we've created just for you - including other Christmas decorations, our Train Garden displays, visit with Santa, refreshments, and more! 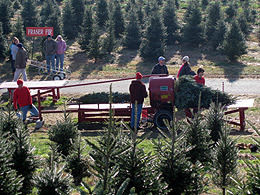 If you prefer not to cut your own tree, choose from our fresh, already-cut trees near our Christmas Barn. Our selection includes Fraser Fir and Douglas Fir, starting at just $25. 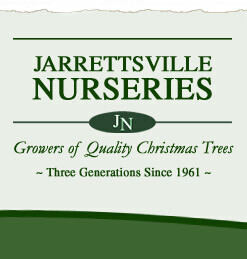 At Jarrettsville Nurseries, we have 1000's of trees to choose from. We provide saws and tree carts for you to use as you choose the perfect tree for your family. When you visit our farm on Holy Cross Road, park and walk to the wagon stop and climb aboard one of our special tree hunting wagons. After you select the perfect tree, be sure to head to the shaking, drilling and baling stations, available at both of our locations. We shake every tree to reduce the loose needles and keep your house a bit cleaner. We also bale each tree to to help you get it home safely, and we drill the trunk upon request to fit your tree stand. What's the best tree for you? Before you visit, check out our Christmas Tree Guide to help figure out what tree is best for you! Warm up after your tree hunting adventure around a bonfire with hot apple cider, hot cocoa, or a pit beef sandwich.